According to a recent news announcement from Texas, a health care worker who had cared for a patient infected with the Ebola virus has also been infected with the disease despite never having visited any of the infected countries and having worn the necessary protective clothing. A nurse working in a Spanish hospital became infected with Ebola after having attended to two patients who had caught Ebola in an African nation. While most people in the Western world only became aware of the Ebola virus in the past few years, the disease has existed in certain African nations for centuries. When a serious disease infected a village, nobody was allowed to leave and outsiders were kept out. The infected village could communicate by drumbeat to appeal for help. Outsiders would bring food to a transfer location near the infected village while locals from the infected village maintained a physical distance to prevent transmission of the disease. Only after the outsiders had left did the villagers approach the drop-off point to collect the food and carry it to their village. A small percentage of people who become infected with Ebola and who survive, become immune to further outbreaks of the illness. In some regions of equatorial Africa, people dine on jungle meat that may include any of several species of monkey and even bats, animals believed to be carriers of Ebola. Historically, African tribes occupied and defended small territories. Tribes that dined on jungle meat would have encountered animal-borne Ebola-like diseases centuries ago, the outbreak of which would have eliminated part of the tribe. After a period of self-imposed quarantine of the village, the healthiest tribesmen would have survived and developed immunity to the disease, possibly passing that immunity on to later generations that could continue to dine on jungle meat. The latest episode of Ebola may have begun with people preparing and sharing jungle meat from an animal that was a carrier. 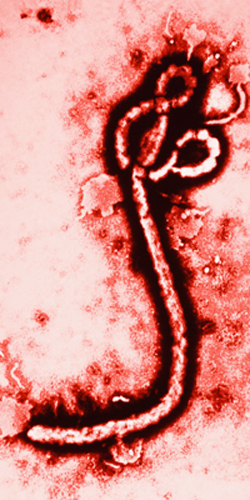 Aid workers providing health care in equatorial Africa may not have encountered Ebola before, and chosen to apply Western medical methods to remedy the outbreak. Private charities previously minimized the number of people who became infected with Guinea worm, a water-borne parasite that lays small eggs that are unable to pass through fine mesh strainers. Separating sewer water from drinking water and passing the drinking water through strainers protected people from Guinea worm infection. Medical personnel employed by Western governments may have been overconfident in their ability to deal with the Ebola virus, initially advising that the disease allegedly cannot by transmitted through the air or by being in the presence of an Ebola-infected patient. A few doctors who operate outside of state medicine have suggested a high-dose of intravenous vitamin C followed by short-term high doses of vitamin D3 to boost people’s immune systems. People with powerful immune systems are known to survive Ebola and some people are known to actually become immune to the disease. The traditional African quarantine method was previously successful in containing the spread of a deadly disease. Nigeria had a few cases of Ebola and imposed quarantine by closing their borders to people from infected countries. They have reported no further domestic outbreaks of the disease. Political leaders in Western and Northern nations refused to impose similar quarantine. Hospitals in industrialized nations have had encounters with antibiotic-resistant bacteria having infected patients, the bacteria having developed resistance after long-term exposure to antibiotics. Western health care facilities such as seniors’ homes have previously used short-term quarantine to prevent the spread of disease. The Nigerian quarantine reduced the amount of public money that would have otherwise been spent to deal with the threat of Ebola being spread within their borders. Western and Northern governments chose an open door policy that involves the expenditure of public money to evaluate the health of people who arrive at airports from affected nations. People whose health is suspect may be held in quarantine or in isolation, perhaps at publicly funded health care facilities. But many western hospitals are already overcrowded, with patients occupying beds located in hospital corridors, which complicates matters, to say the least.